Following Waymo’s clear announcement that unmanned taxi service will be available in Phoenix in 2018. 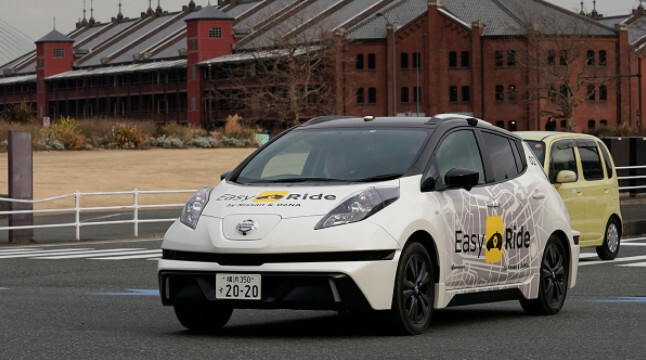 Another big car maker Nissan holds hands with Japan’s famous game maker DeNA for its new brand, Easy Ride, to jointly develop autonomous driving services. In recent years, DeNA has been working on autonomous driving buses and distribution services in Japan. This is not the first time for Nissan to cooperate with DeNA. As early as January 2017, Nissan Motor Co. and DeNA have partnered to develop a new type of travel service equipped with automatic driving technology. Both parties hope that Nissan Intelligent Mobility and DeNA will be closely integrated with the development and operation of autonomous driving travel services in the field of network and artificial intelligence through autonomous driving, electrification and vehicle interconnection. EasyRide, a collaboration between the two companies, is based on the concept of “more free travel”, enabling consumers to use autonomous driving to travel freely anytime, anywhere, through a dedicated mobile application to achieve one-stop destination setting, vehicle calling and fare payment The solutions, Nissan and DeNA both hope Easy Ride will be a new complement to the existing transportation infrastructure and will suggest to visitors the interesting spots and places of interest. It is understood that both sides plan to carry out the site test in Yokohama, Japan from March 5 to March 18, and currently there are 300 sign-ups. Nissan said the feedback received will be used to adjust travel services. 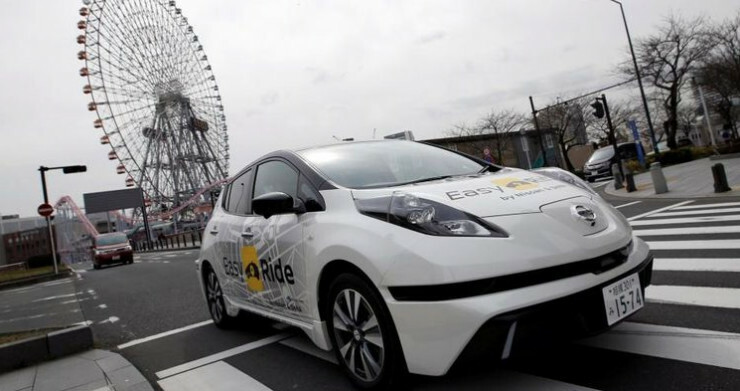 The Esay Ride route, a 2.8-mile-long shopping area across Nissan’s headquarters to downtown, hopes Nissan will launch Esay Ride commercial services by 2020, but details such as pricing are not yet finalized. Compared to other autonomous driving technologies, Easy Ride cars are equipped with lenses, sensors and radar, recognizable pedestrians, intersections, traffic and other vehicles. However, Japanese law does not allow completely unmanned autonomous driving, so there are still human drivers in the vehicle ready to take over the vehicle. Nissan also claims that the system is not flawless and sometimes requires manual intervention. The Easy Ride uses Leaf self-driving. As early as the end of 2017, Nissan Leaf’s second-generation Nissan Leaf electric vehicle was launched on Nissan’s ProPilot Assist, a self-developed semi-autonomous driving system, and officially landed in the U.S. market. The foundation of the ProPilot Assist is the existing Advanced Driver Assistance System (ADAS). Features include lane keeping, adaptive cruise, and enhanced software capabilities. The whole system uses the front lens, front millimeter wave radar, ultrasonic radar and electronic control module. 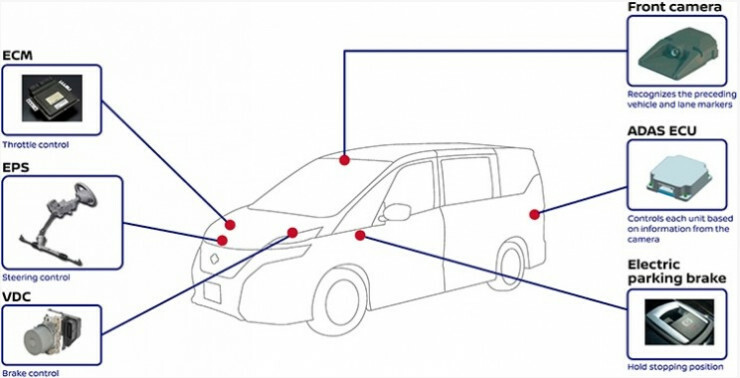 ▲ Nissan Leaf body control systems and sensors. Not only that, when Nissan CEO Carlos Ghosn publicly promised that the ProPilot Assist system will progress every year until it reaches Level 4. However, he also stressed that the introduction of technology in the process, as long as the remarkable traffic accidents, it will crack down on consumer confidence, resulting in opposition to the voice of car manufacturers. Ogi Redzic, senior vice president of Nissan, Renault SA and Mitsubishi Motors Corp. alliance, said Easy Ride technology will provide a safer way to travel because most accidents It is human error. Redzic is responsible for the Alliance’s Connected Vehicles and Mobility Services, which he believes are the key to fail-safe network security. More and more car companies join the armament race in the field of automatic driving. Although Nissan has always been cautious, but has accumulated in the field of automatic driving, Nissan introduced ProPilot autopilot technology, just after a lapse of six months, ProPilot upgraded again.